Note:This inspection procedure is intended to inspect propellershaft systems with 2-or 3-U-jointsonly. Correct phasing of a propeller shaft refers to the relativealignment of the U-joint yoke flanges to each other to provideproper cancellation of the U-joints. The yokes should be directlyaligned to within the range specified in this procedure. Raise and support the vehicle. On vehicles with solid axles,ensure that the drive axle is supported at rideheight—vehicle body supported by suspension components.Ensure the wheels are free to rotate. 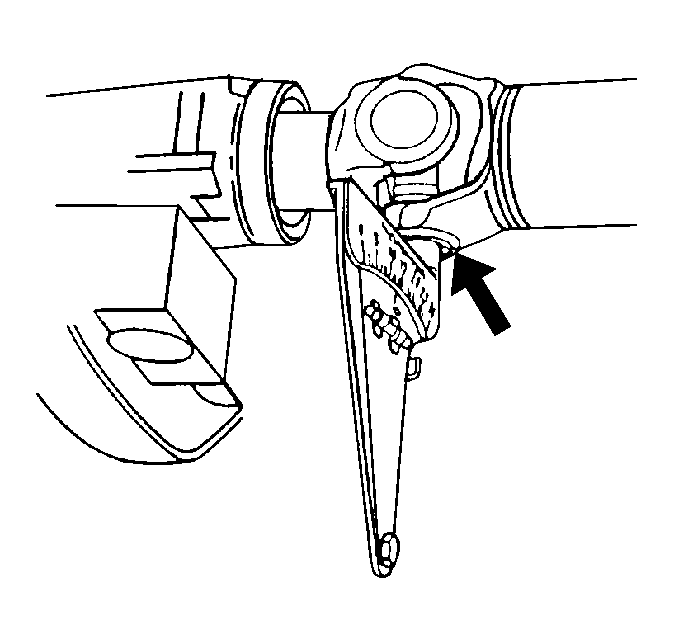 Refer toLifting and Jacking the Vehicle.Place the transmission in NEUTRAL.Clean any corrosion or foreign material from the U-jointbearing caps.Remove any of the U-joint bearing cap snap rings that mayinterfere with the correct placement of theJ-23498-ADriveshaft Inclinometer, or equivalent. Inspect the prop shaft for proper phasing.Rotate the prop shaft or shafts to align the shaft yokeflanges vertically.Install theJ-23498-ADriveshaft Inclinometer, or equivalent to the lower U-joint bearing cap of therear U-joint of the shaft. TheJ-23498-ADriveshaft Inclinometer, or equivalent should be aligned perpendicular to thepropeller shaft.Set the indicator line on theJ-23498-ADriveshaft Inclinometer, or equivalent to 15, the horizontal reference.Rotate the propeller shaft slightly to center the bubble tothe indicator. The U-joint is now vertical.Without disturbing the setting on theJ-23498-ADriveshaft Inclinometer, or equivalent, remove theJ-23498-ADriveshaft Inclinometer, or equivalent from the rear U-joint bearing cap.Install theJ-23498-ADriveshaft Inclinometer, or equivalent to the lower U-joint bearing cap of thefront U-joint of the same shaft.Observe and record the reading of the front U-joint with theJ-23498-ADriveshaft Inclinometer, or equivalent still set to 15, the horizontalreference.For prop systems with 3-U-joints, rotate theshafts 1/4-turn and repeat steps 5.1–5.7 forthe other prop shaft.If the difference between the front and rear U-joints of awelded yoke propeller shaft is 3-degrees or less, thepropeller shaft is properly phased.If the difference between the front and rear U-joints of awelded-yoke propeller shaft is greater than 3-degrees,the propeller shaft is either constructed improperly, or damagedfrom twisting. Refer toPropeller Shaft Phasing Correction.If the difference between the welded yoke and slip yoke of apropeller shaft is 1.5-degrees or less, the prop shaftis properly phased.If the difference between the welded yoke and slip yoke of apropeller shaft is greater than 1.5-degrees, thepropeller shaft is either constructed improperly, or damaged fromtwisting. Refer toPropeller Shaft Phasing Correction.